The species has a widespread but patchy distribution in much of Britain but is relatively uncommon in the south-east of England. It is widespread across the whole of Europe. 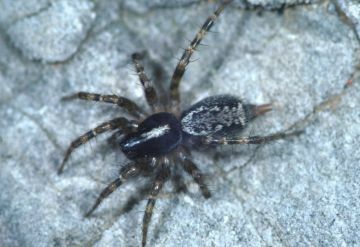 This spider can be found on stony ground, in rocky crevices, on low vegetation, under bark, and on low bushes, inland and by the sea, including amongst stones on the upper shoreline. It also occurs on the hills of northern England, where it is often found in the cracks of stone walls. In Scotland it is equally common in houses (Roberts 1995). In south-eastern England there are records from sparsely vegetated rail ballast at disused railway sites. Both sexes are mainly found from early to mid-summer but females can be found at most times of the year and males have occasionally been recorded into November. The small, whitish web with a perfectly tubular retreat is characteristic. Common in the north. However in the south of England it is much more restricted and in the south-east it is only occasionally encountered. Account last edited by Geoff Oxford at 16:09 on Thu 7th Jun 2018.